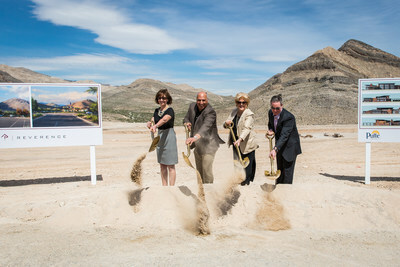 LAS VEGAS, April 7, 2017 -- Ground was officially broken yesterday on a 16,000-square-foot indoor/outdoor recreation facility, the centerpiece of Reverence, a new village built exclusively by Pulte Homes in the master-planned community of Summerlin®, a development of The Howard Hughes Corporation .® The ceremony, headlined by Las Vegas Mayor Carolyn G. Goodman and Las Vegas City Councilman Stavros Anthony, Ward 4, signals the impending public opening of the 300-acre village in early June. Located on an elevated ridgeline along the Las Vegas valley's western edge and nestled along the base of Red Rock Canyon National Conservation Area, Reverence is Summerlin's northernmost village and one of Southern Nevada's most exceptional residential developments to take shape in years given its location, size and diversity of product offering. Nearly 900 total homes, each embodying a range of transitional and contemporary designs, are planned for Reverence. According to Jason Demuth, Division Director of Marketing for PulteGroup, it's rare for a single builder to develop an entire village in the master-planned community of Summerlin. "This is a special opportunity to execute on a comprehensive vision to create an entire village on one of Southern Nevada's most spectacular pieces of land that overlooks the entire valley to the east and is situated at the base of Red Rock Canyon. It's hard to replicate this location, and we couldn't be more excited about this once-in-a-lifetime opportunity." The Reverence Recreation Center , which is expected to be complete by Spring 2018, features a state-of-the art fitness center, outdoor resort and lap pools, spa, pickle ball and tennis courts, multi-purpose room, great room, fire pit and outdoor terrace, men's and women's locker rooms and wet deck for poolside sunbathing. The Recreation Center is for the exclusive use of Reverence residents who live in one of seven neighborhoods inside the guard gate. Plans for Reverence include six collections of homes that will be displayed in two model parks reflective of the distinct areas in which they are located. Two collections offering affordable luxury will feature two- and single-story homes ranging from approximately 1,550 to 2,775 square feet. Four collections, all located behind a guard gate, will feature a luxury lifestyle with homes from approximately 2,150 to 4,850 square feet in single- and two-story floor plans, including estate homes. In total, Reverence will offer over 20 individual consumer inspired floor plans with up to 11 homes modeled. In addition to an abundance of Reverence specific amenities, including miles of walking trails and an eight-acre park with an amphitheater, walking track and volleyball, basketball and tennis courts, residents will enjoy access to all the amenities that make the Summerlin lifestyle so extraordinary. This includes parks, trails, golf courses, schools, Downtown Summerlin® offering fashion, dining, entertainment, Red Rock Casino, Resort & Spa and the future practice facility of NHL franchise Vegas Golden Knights, the city's first professional sports team. The village name, Reverence, is inspired by the stunning topography and geography of the area, most notably Red Rock Canyon which forms the village's backdrop, ensuring no future development will occur to the west of Reverence. Adjacency to Red Rock Canyon provides Reverence residents with immediate access to the area's world-class active outdoor lifestyle, including hiking and rock climbing, mountain and road biking, horseback riding and more. The elevation of Reverence, at an average of 3,200 feet above sea level, delivers incomparable and sweeping valley views to the east. And like other areas of Summerlin that boast a similar elevation, Reverence will enjoy cooler temperatures - a significant advantage in the desert climate. Pulte Homes, a 65-year-old nationwide homebuilding company, is one of the country's largest and has been building in Southern Nevada since 1994. In addition to Reverence, Pulte is currently selling three popular neighborhoods in Summerlin: two in The Paseos village – Estrella and Segovia; and Vistara in The Cliffs village. To date, Pulte has built thousands of homes in Summerlin encompassed in over 30 neighborhoods throughout the master plan. To join the Reverence homeowner interest list, please call 877-853-2699.